, a dissenting minister of the baptist persuasion, was born at Blackwater-farm, in the parish of St. Michael, and district of St. Alban’s, Hertfordshire, on March 1, 17 10. He appears to have had some classical education, which he afterwards diligently improved, but was not regularly educated for the ministry. In 1738 he published “An abstract of English grammar and rhetoric,” and an advertisement at the end of this volume intimates that he then kept a boarding school. Two of his pupils have been ascertained, Dr. Hugh Smith, an alderman and eminent physician in London, and Dr. William Kenrick. He commenced preacher, without any of the usual forms of admission, but merely because he was thought capable of preaching, when he was about twenty years old; and having been approved of at his outset, he continued and was settled as minister of the baptist congregation at Reading. 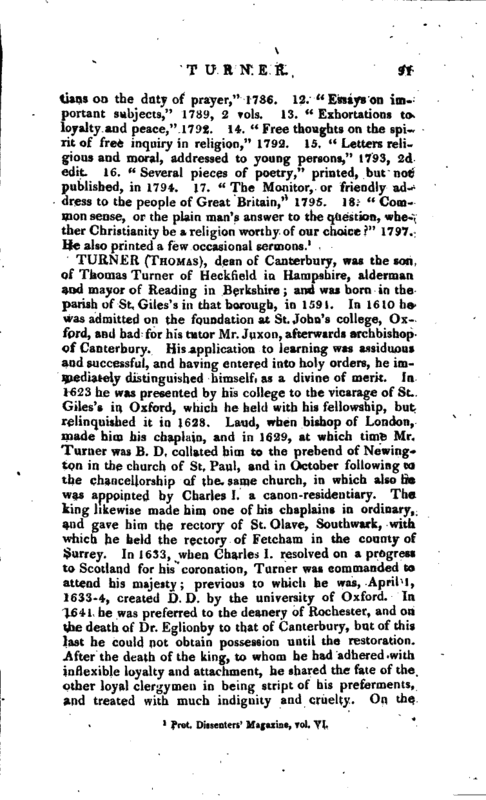 From this he was invited to become pastor of a similar congregation at Abingdon in 1748, where he spent the remainder of his long life. He began to preach and to print early in life, and he preached and printed to the last. 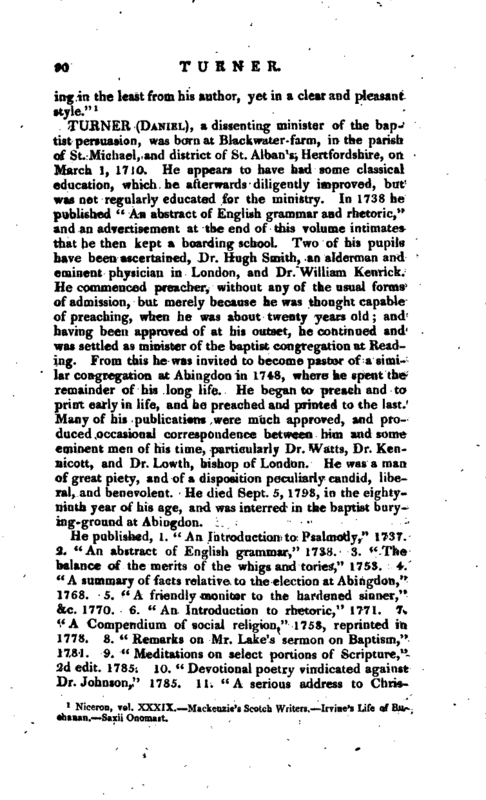 Many of his publications were much approved, and produced occasional correspondence between him and some eminent men of his time, particularly Dr. Watts, Dr. Kennicott, and Dr. Lowth, bishop of London. He was a man of great piety, and of a disposition peculiarly candid, liberal, and benevolent. He died Sept. 5, 1798, in the eightyninth year of his age, and was interred in the baptist burying-ground at Abingdon. Prot. Dissenters’ Magazine, vol. VI.